Christopher Devine, it should be noted, is not an advocate for panhandling. It’s a rare occasion that he gives money to panhandlers, in fact. The 28-year-old from the upscale North Shore suburbs of Chicago grew up a long way from the problem of homelessness. But when he returned to Chicago after college, he began to notice the homeless just beyond his front door. He started taking a tape recorder out with him to interview homeless people. He asked them about their lives, asked them to tell the stories of how and why they became homeless. At first, he planned to write an oral history of homelessness in Chicago from those interviews. Eventually, they turned into a series for the Huffington Post. After that, his project finished, he went back to his life. Only, he kept noticing the homeless. One, in particular - a woman on Michigan Avenue - captured his interest. She was holding a tattered cardboard sign on which was scrawled, in fading handwriting, the long story of her homelessness. It would have been illegible to most of the people walking by - if they had bothered to try to read it. But they weren’t bothering. They barely looked at her. Even those who gave her something. “What’s the message she’s trying to get across?” Christopher thought. This is what came to his mind. Homeless. Exactly like that - bold, Helvetica font, black on white, right down to the period. So he went and made 35 signs exactly like that, laminated them, and started passing them out to homeless people. Then he just kept doing it. He estimates now that he’s given out 150 signs. Not everyone he approaches takes one. One guy told Christopher he was trying to get a job and didn’t want to identify as homeless. So Chris created a second sign: Please Help. He recognizes that his sign project won’t cure the problem. “This project accepts the reality that in the absence of major systemic overhaul, there will be panhandling,” he says. But he has hopes that it might be a step in the right direction. While he intends for the signs to help the homeless in the short term, he hopes that they’ll also wake the rest of us up to the problem, and push us to consider solutions. 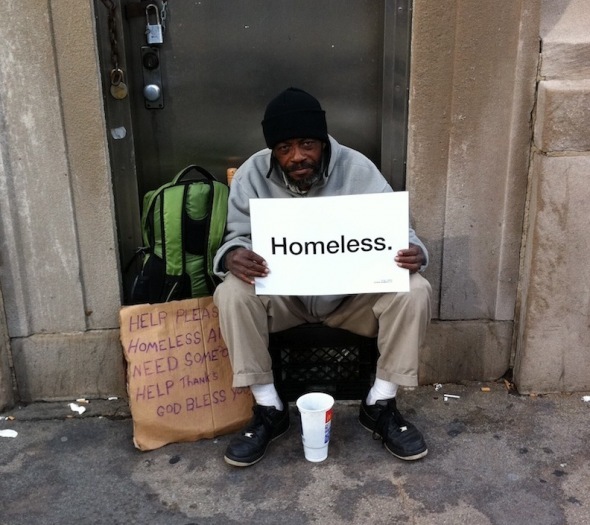 What I like about Chris’ sign project is that he saw homeless people. He saw, and he cared, and he ventured to do something. And, while someone might say that a panhandler with a printed, laminated sign is still a panhandler, at least that someone would be talking about that panhandler. Instead of, you know, doing his level best to ignore his existence. But Chris reminds us to look past the decorations on our own front doors this Christmas. In that, he’s in agreement with the One Who Christmas is supposed to be about. He told a story about a rich man and a beggar that starts out exactly as you expect a story about a rich man and a beggar to start. The rich man is inside, enjoying a feast. Call it a holiday party. Lazarus, he’s outside the rich man’s front gate - too close to be missed, too far away to get what he needs on his own. He’s an outsider, but not the kind of outsider anyone might be pardoned for not noticing. He’s right there, and he doesn’t ask for much. Just some leftover crumbs. The rich man never notices. That’s where the story comes off the tracks. The rich man and Lazarus die, and find that in the afterlife the situation is exactly the same. You might hope that there wouldn’t be suffering and want in the next world, but there is. There’s still a rich man on the inside, and a beggar outside looking in, wanting just a crumb, just a drop, of what the rich man has. Only now, the rich man is the beggar. Lazarus has what he never had in life. So the rich man asks for Lazarus to be sent from the afterlife back to his still-living brothers, to warn them, to tell them to be aware of the beggars at their gates, to feed them and clothe them and take the responsibility to care for them. Sort of a Christmas Carol kind of scenario, I guess, with the brothers playing the part of Ebenzer Scrooge. But Dickens had it wrong, apparently. The rich man is told that all his brothers have to do is listen to Moses and the Prophets. And if they won’t listen to Moses and the Prophets telling them to care for the poor, then they won’t listen to someone visiting from beyond. We often get hung up on that story’s description of the afterlife, but that’s just the backdrop. The real point of the story is that ending: if you won’t listen to the Word of God telling you to take care of the poor, you won’t listen to anyone. Not even One Who has risen from the dead. So as we open our gifts and eat our feasts and sing our songs and light out candles and enjoy the company of family and friends, let us not forget that the One we claim to honor with all this is the One who warned us to be mindful of the Lazaruses at our gates. The One who said that we haven’t listened to him at all if we think we can barricade ourselves against the need around us with a little holly on our front doors. Chris’ signs say it all. Homeless. Please Help. That’s the way to celebrate Christmas. Thx for your heart. Tomorrow on Christmas morning, we as a church in Perth Australia will be sharing breakfast with 300 people "without family", the "family-less" in the community. It is a tradition that we want our kids to inherit - that Christmas is about being like Him. What a great tradition! God's blessings on your efforts to serve those in your community without families. Merry Christmas! Thank you for such a thoughtful reflection. I hope you had a wonderful holiday. Thanks, Christopher. God's blessings to you in this new year!